Please take a minute to read the email we just received and let us know if this might be of interest to you or someone you know. We would like to help in any way we can. Dear Mathew and Amy & Charleston Chapter Members, Architecture for Humanity received a request from the White House and the Corporation for National & Community Service in regard to the 'summer of service' (http://serve.gov). They are looking for organizations with local chapters in need of volunteers as we are one of the only large-scale 'architecture' focused groups in the country. They have asked if we can come up with at least 10 projects (in need of volunteers). Attached please find is an excel form that we are asking you to fill out and return to us as soon as possible. All the information we receive from chapters will have to be relayed to the Corporation for National & Community Service by Tuesday (tomorrow). I apologize for the short notice, but we just found out about this opportunity earlier today and think that this is a great opportunity for all of us to participate in the Summer of Service. 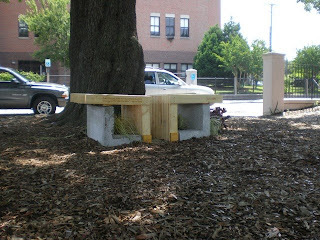 The latest project from afh | charleston. Thank you to Fisher Recycling, Kiawah Island Resorts, Lowe's, JMO Woodworks, A&E Printing, Carolina Nurseries, Hyam's Nursery, Studio A Architecture (Whitney Powers), Liollio Architecture (Tommy Schrimpf), Thompson + Young Design (Jon Thompson), LS3P Associates, and Team.Liollio. These individuals and groups contributed a great deal to the intellectual and monetary pursuit of the Guerrilla Bench Project. 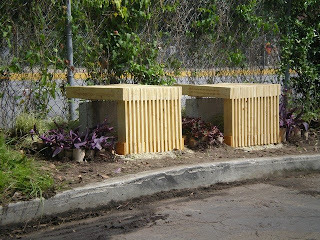 We had a great time designing and building the Guerrilla Benches and we appreciate all your guidance.